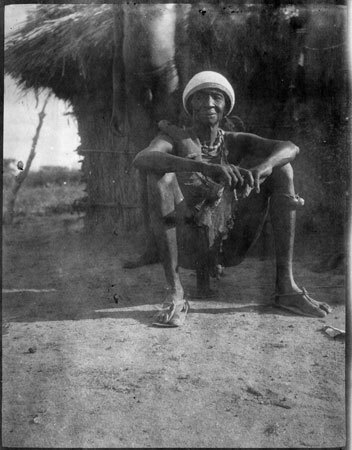 A portrait of a possibly Nuer or Dinka man seated on a stool wearing an animal skin, bead neck ornaments, and headgear which seems to be made from basketry, covered with white material. Morton, Chris. "Portrait of a man" Southern Sudan Project (in development). 03 Jan. 2006. Pitt Rivers Museum. <http://southernsudan.prm.ox.ac.uk/details/1998.204.5.97/>.